FIELD OF VISION: Robertson receives an invitation to a city in another dimension in Bird's preachy futuristic fable. This isn't so much a movie as two hours-plus of product placement. The nerve of Disney to sell us tickets to an ad for a theme-park attraction to which it wants to sell us tickets. That's not synergy. That's corporate greed. At least Pirates of the Caribbean had Johnny Depp when he could still be fun and, early on, stories and characters entertaining enough to distract you from the fact that you were watching a $250,000,000 commercial. 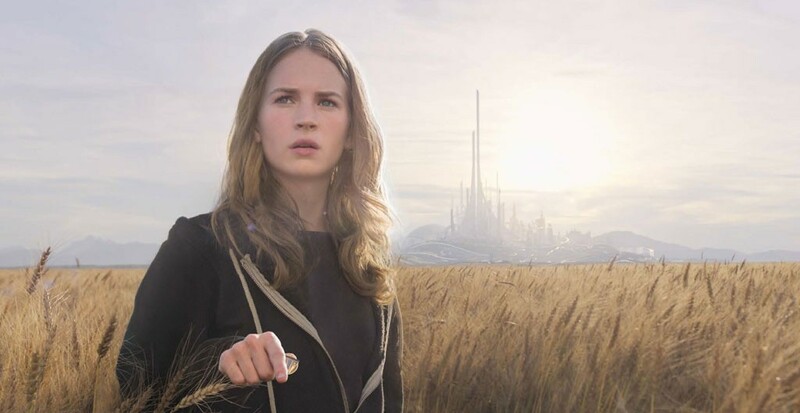 Tomorrowland isn't designed to distract us from Disney's marketing. Entertainment barely comes into the picture. Rather, Tomorrowland is designed to lecture us. Cowritten and directed by the previously estimable Brad Bird (Ratatouille), this is that rare family film guaranteed to leave young and older viewers equally unsatisfied. Take the opening sequence: Frank (George Clooney) looks into the camera and begins to tell a story. Behind him, a clocklike device displays a running countdown. He's interrupted by a perky youngster named Casey (Britt Robertson) who has her own ideas about how to tell the story. Whenever one interrupts the other, the countdown pauses. Rinse. Repeat until you find yourself thinking of The Monuments Men and trying to remember the last time you enjoyed a George Clooney movie. This goes on and on until finally the movie starts, and you realize that cutesy back and forth between Frank and Casey served zero purpose beyond filling time. Speaking of time, that clock with the countdown is never explained. Both elements of the intro are signs of what's to come. The story starts at the 1964 New York World's Fair. Young Frank has brought a homemade jet pack — which he knows doesn't work — to show the judges at an invention contest. They're suitably unimpressed. A young girl with a British accent (Raffey Cassidy) sees something special in Frank, however, and slips him a magic token. It admits him to the gleaming dream metropolis that is Tomorrowland, where it seems only a matter of time before you'll bump into George Jetson. The girl's name is Athena and, the next thing we know, we're in the present day and she's slipped a token to Casey, evidently owing to the latter's passion for NASA's space program. Whenever Casey touches the token, she finds herself suddenly on the set of Field of Dreams with the shimmering metropolis of Tomorrowland in the distance. The rest of the film chronicles the chaos that ensues after Athena unites Casey with the now grizzled, disillusioned Frank and they set out to right the course of humanity's future while being pursued by grinning robots in black suits. Nonstop special effects have been created to divert our attention from gaping lapses in logic and from plot holes the size of, well, black holes. In places, the CGI mayhem is snazzy, but mostly the whole business is exhausting. It hardly helps that Robertson comes close to exceeding the perkiness limit even for a Disney product. It gets worse. Bird isn't content to baffle us and give us migraines. He wants to teach us Something Very Important. Hint: It has to do with how the future is in our hands. How we should be more positive and watch fewer apocalypse movies (such as next week's non-Disney-produced San Andreas). Honest. The director's vision of a back-on-track human race looks a lot like that classic Coke spot referenced in "Mad Men"'s finale. With Tomorrowland, Bird wants to teach the world not to sing, but to think in perfect harmony. Which feels a tad Big Brother to me. In the future, I think I'd prefer it if the filmmaker spent less time saving us and more, say, entertaining us.